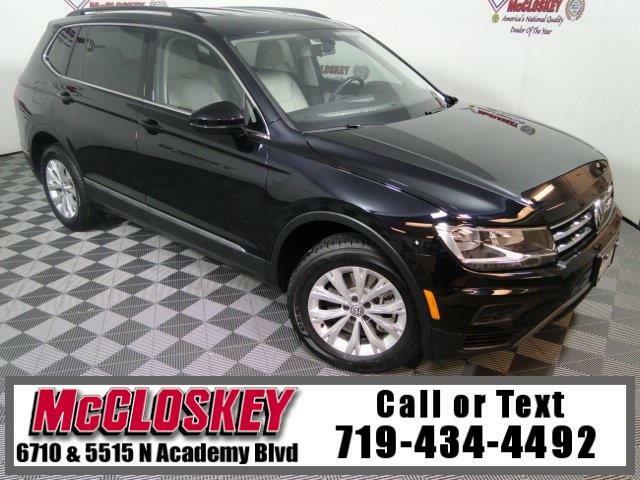 Stylish 2018 Volkswagen Tiguan 2.0T SE 4Motion with Blind-spot Monitor, Backup Camera, Bluetooth Wireless, Heated Leather Seats, and Premium Sound System! The SE includes those Driver Assistance features, plus heated washer nozzles, keyless entry and ignition, dual-zone climate control, simulated leather upholstery, heated front seats, a power-adjustable driver's seat, a leather-wrapped steering wheel, an 8-inch touchscreen, satellite and HD radio, voice commands, two extra USB ports and the Car-Net Security & Service (remote access to the vehicle through a smartphone app, automatic crash notification, and monitoring services for young drivers). This vehicle passed our 110 multi-point inspection and is backed by our National Quality Dealer of the Year Award. We are an ''A+'' Better Business Bureau Rated Business. We offer low interest rate financing, low down payments and the highest trade allowances in the state! Here at McCloskey we do things a bit differently, we shop our competition every day to ensure a great value to you. Come on down and experience it for yourself. This McCloskey Assured vehicle includes a Vehicle History Report!! At McCloskey we strive to provide ASSURANCE, TRUST, VALUE AND QUALITY! Call 719-434-4492.